Our farm in Columbus, IN operates even during the coldest months of the year. Our specialties in winter are sausages and other pork products. Since the 1930s, we’ve been slaughtering farm-bred pigs to make fresh sausages and other pork products. Not only is our pork sausage a household staple in our community, but it’s also famous for miles around. People drive from surrounding areas and even from out of state during the sausage season to stock up. You can use ground pork in nearly any recipe that calls for ground meat, from meatballs and burgers to chili and soup. Start your day right with a well-seasoned breakfast sausage. Appetizing and filling, it’s an essential ingredient in an old-fashioned country breakfast. Tenderloin is juicy, flavorful, and easy to cook. It’s convenient to have on hand for days when you don’t have a lot of time to prepare a meal. Try putting cubed tenderloin in a slow cooker with peppers, hot sauce, and lime juice to make burrito filling. Flattened and tenderized pork tenderloin can be seasoned and pan-fried quickly, saving you time. You can also stuff them with mushrooms and herbs. The possibilities are nearly endless! Crunchy pork cracklings make a scrumptious side dish or snack. Just remember to buy enough to share with friends and family. 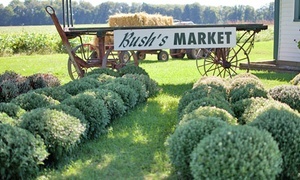 To learn more about our farm and market, call us at 812-379-9077.